Owning a scooter in Birkenhead gives you the independence to move around town with ease and without any of the hassle that comes with using public transport. Luckily, Direct Bikes makes owning a scooter in Birkenhead as simple as A-B-C. Here are some more reasons why you should own a scooter in Birkenhead. Hit the Road Earlier: Owning a scooter in Birkenhead guarantees that you will be hitting the road earlier than most other road users. This is because you can legally ride a 50cc scooter at the age of 16. Faster in Traffic: Scooters are smaller than most vehicles, which means they can conveniently snake through tiny gaps in traffic than cars. Price: Scooters are a cheaper alternative to other vehicles. They are also inexpensive to maintain. 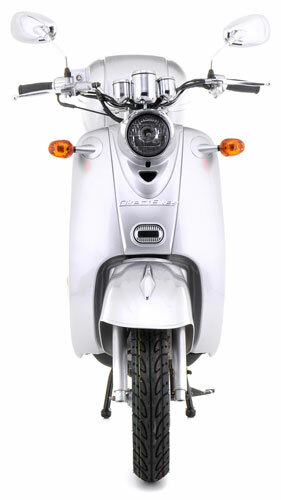 Fuel-efficient: Scooters consume less fuel than other vehicles, which means you will be saving more on fuel costs. Price: Scooters are cheap to buy and maintain, but we raise the bar even higher by offering the cheapest scooters on the market. Insurance: Direct Bikes also helps you compare the hottest scooter insurance deals in Birkenhead. Design: We are keen on offering you aesthetic diversity, which explains why our range of 50cc and 125cc scooters come in various sizes, styles, and colours and are also customisable. We don’t have a dealership in Birkenhead, but we can get your scooter to you faster than even other scooter dealers that have a dealership in Birkenhead. All you have to do is input your delivery details during payment, and we will bring your scooter to your doorstep.